Less than one month to go before the official judging begins on all submissions. The XXL Big Wave Awards first launched in 2000, to recognize the surfer who rode the year’s biggest wave. Now approaching its 15th anniversary, XXL has grown to include seven categories. Timeframe: The XXL Awards are open to waves ridden between March 20th, 2014 and March 20th, 2015. Nominees are announced the last week of March and the winners are revealed at a gala awards ceremony on May 1, 2015 in Southern California. Who are the judges? There are two panels: One small group of professional surf photography analysis experts and experienced big wave veteran surfers who measure the tallest waves in the objective categories including the Paddle Award and the XXL Biggest Wave Award (caught by any means including tow-ins). The other subjective (or “gut feel”) categories are decided by a veritable academy of respected members of the big wave community, including all XXL competitors, photographers and videographers and members of the media who cover big wave surfing. How do they judge? The biggest wave awards use techniques which estimate the height of the wave relative to the known height of the surfer while factoring in the distortion caused by the photo’s angle and lens size. The judges for the subjective divisions are urged to consider sustained performance throughout the entirety of a ride — including the overall quality and quantity of maneuvers or critical positions achieved — and to evaluate the skill of the surfer in a challenging situation above the good fortune presented purely by the unique shape of a particular wave. Awarded to the individual surfer who demonstrates the most advanced and committed level of big wave surfing during a successful ride, as judged by available video-footage. 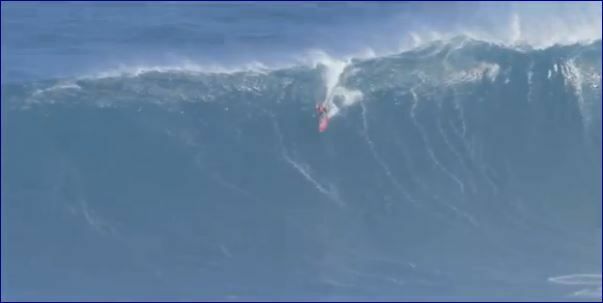 Here’s Dorian cementing his status as the Best ever, esp in the Jaw’s of Peahi.